Taking your time is also a good idea when trying to gain experience with tea. New tea drinkers, which would include me since I'm still learning all the different types of tea and quality spectrum, get very excited about trying good tea; experiencing one good tea makes us eager to find the next good one to compare it to. This is a good way to gain experience quickly, but we must remember to slow down and take time to get to know each category of tea well. This is the type of experience that must be acquired with patience to expose oneself to many complexities and characteristics within the same type of tea over time. 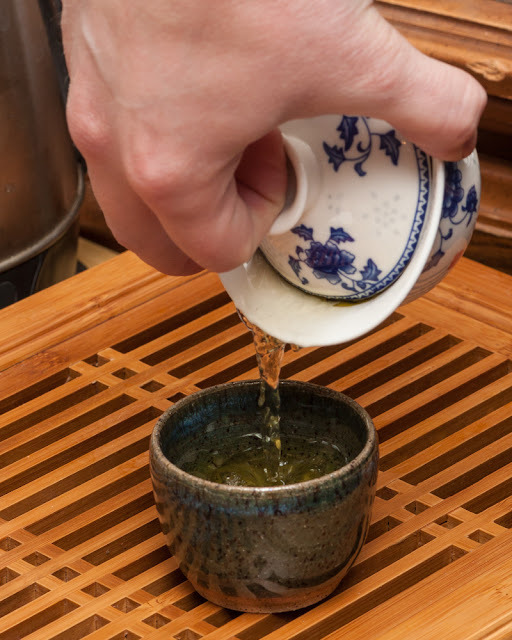 I doubt everyone would be able to agree on how much time it may take to gain a good understanding of any one type of tea, but it is obvious that the time cannot be quick. Perhaps there actually is no finish line since we can continue to drink new teas throughout life. 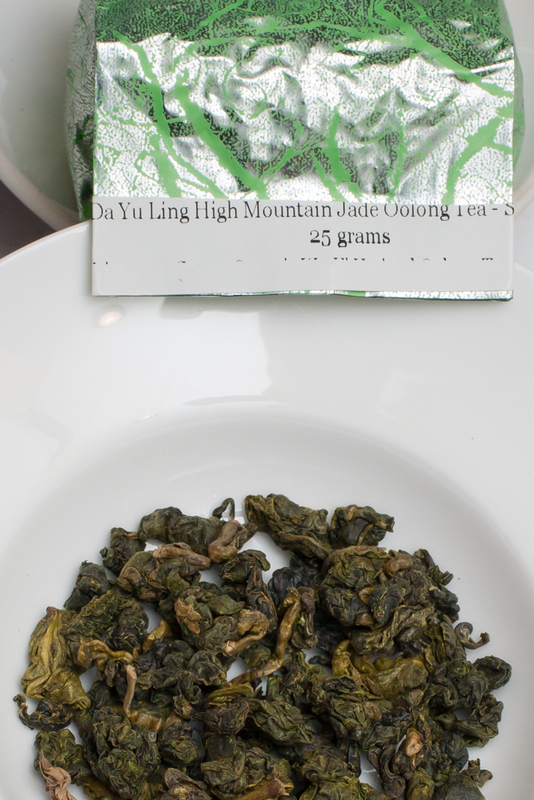 But things get complicated when it comes to high mountain (gaoshan) oolong from Taiwan's Da Yu Ling area. Some of the most famous quality gaoshan oolongs have come from the highest peak of Li Mountain, known as Da Yu Ling, and demand (and thus price) for these teas is quite high. 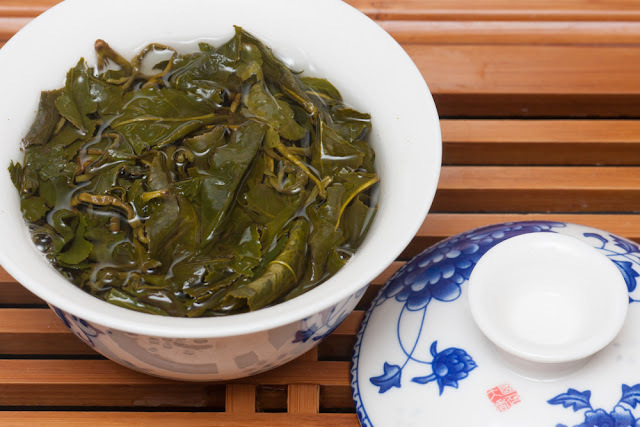 It would make sense for someone on a tea journey to get to know more accessible gaoshan oolongs first before finally reaching for something like Da Yu Ling. The issue though is that there are fewer Da Yu Ling tea farms now than just a couple years ago since the Taiwanese government has reclaimed some of this high mountain land to protect the peak from the negative side effects of farming, such as erosion and landslides. Other farm area may be used for different agricultural products too, not always teas. I do not know the future of tea from this area-- perhaps some tea will still be grown at Da Yu Ling for years to come, or perhaps not, but it is clear that the "famous" Da Yu Ling teas from the highest farms are already gone. Those of us who have not had them, we may have waited too long. But is it too late to have any good tea from Da Yu Ling at all? Thankfully the Taiwan Sourcing team (taiwanoolongs.com) have trekked the winding narrow roads of Li Shan to reach Da Yu Ling and returned with what they believe is still a perfect Da Yu Ling oolong. I have decided to delay no longer. Now is my time to try Da Yu Ling. Although I have shopped with Yunnan Sourcing several times, this is my first order with their new sister company Taiwan Sourcing (taiwanoolongs.com). I ordered four different Spring 2015 oolongs, including this Da Yu Ling Jade. I was happy to see that the oolong I ordered came vacuum sealed, which I believe is very helpful at locking in the freshness that makes this type of oolong so good. 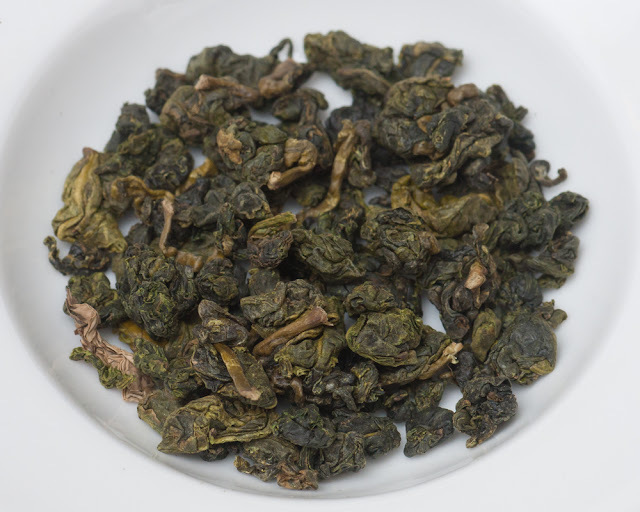 Although I've read that some oolong has aging potential, these "jade-style" oolongs may not be the best choice for aging and are probably best consumed as fresh as possible. This tea was harvested in Spring 2015, but the vacuum seal has allowed it to stay very vibrantly green and aromatic. 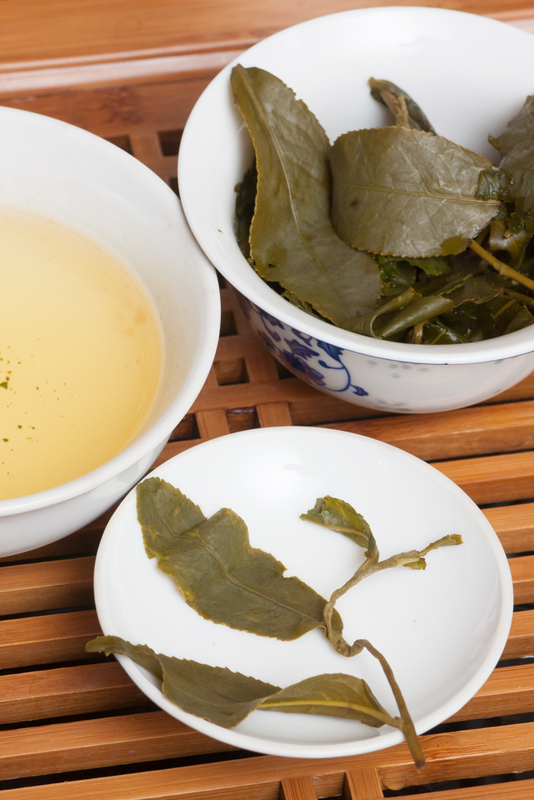 In the past I have always brewed jade style oolong with water around 185 degrees (Fahrenheit). I've heard though that high quality oolongs, even ones that are on the green end of the oxidization spectrum, will be able to handle boiling water just fine. So far I have tried a couple different approaches, and as of right now I have settled on 200 degree water for this tea. When brewed with water right under a boil it was certainly good and never became bitter, but the slightly lower temperature seemed to bring out a little more sweetness which I liked. With this type of tea it is not really necessary to do a rinse. I always expect the first 30 second infusion of a rolled oolong to be a bit weak because the leaves are still re-hydrating and unrolling, but I usually go ahead and drink this infusion instead of tossing it out like a rinse. With the Da Yu Ling though I was amazed that even this weak first infusion was just as strong and flavorful as the best infusion of some lower quality jade oolongs I've had. What a great start and an indication that this tea really is as good as I hoped it would be. The aroma coming from the wet leaf and even the liquor was very strong and rich. All the great gaoshan aromas were there-- buttery honey and fruity notes (this time being peach/apricot), and the Da Yu Ling also had a deep cooked greens vegetal aroma balanced with a gingerbread or brown sugar sweetness. I was surprised to find that the mouthfeel was actually somewhat active. Not as much as a good sheng puerh, but this tea definitely awakens the tongue, and the vibrant yellow liquor has a thick broth-like consistency. The taste is bursting with tea perfume flavor. I used the typical amount of leaf that I normally would for this type of tea (5g in 80ml), but the flavor overall is much more intense than I've had from others. The tea has the buttery honey flavors that I like in goashan, but it also has a rich vegetal taste. Taiwan Sourcing notes that this is the result of high altitude slow growth and processing. This is definitely one of those teas that can truly be described as being like a soup. The aftertaste blossoms in the mouth immediately after swallowing and is very unique. It has tea perfume and guava characteristics, but as those initial flavors fade, I also get a sense of fresh spring air and I am immediately reminded of the photos from part III of Taiwan Sourcing's Da Yu Ling blog entry where they are laying in the grass drinking oolong. This fresh air is not the absence of taste though, but it is instead as if the tea has a cleansing effect. This effect is so strong that I get a really interesting sensation that my mouth has been cleaned and refreshed, as if drinking a cold glass of pure spring water outside on a pleasant spring day. Perhaps this is the qi of Da Yu Ling. By the time I decide that I have reached the end of this tea I feel a sensation of fullness as if I have finished eating a meal. I can tell that this is a good quality tea because the flavor is so consistent and potent over many infusions. It does not suddenly drop off or turn bad, or perhaps it is turning out so good because I am taking my time to brew it as well as I can. I am glad that I decided to go ahead and try Da Yu Ling oolong while I had the opportunity to find one from a trusted tea seller. Although I have reached this wonderful peak, I know I am not finished yet with discovering and learning about Taiwanese gaoshan. I am going to continue my tea journey by seeing what else Taiwan can offer, and I feel like Taiwan Sourcing is doing a great job at this as well. Looking through their list of other teas, I see that they are also exploring some mountains and regions that I am not familiar with, such as Lala Shan, Wu She, and Fu Shou Shan. I look forward to trying all these other regions next, but for now I am going to slow down, relax and patiently enjoy the rest of my Da Yu Ling. Link to Taiwan Sourcing's 2015 Spring Da Yu Ling.